In these almost three years of nomadic life, we traveled to Chiang Mai 4 times. This last season in Thailand we realized that as much as we love the city, we didn’t visit all the attractions in Chiang Mai, and it was time to hurry up and visit all the cool places in town. With a few days left before our departure, we went for our first staycation, exploring what to do in Chiang Mai that is unique, awesome and that we were going to miss. We have already visited some of the Chiang Mai tourist attractions, we also have been in the mountains of Doi Inthanon exploring coffee plantations and spotting waterfall. So this staycation was planned to be a mix of top things to do in Chiang Mai plus our favorite spots. Our Chiang Mai itinerary included yummy food, culture, nature and relaxation, perfect for anyone that have already visited the city, or is planning a trip to Chiang Mai for the first time. 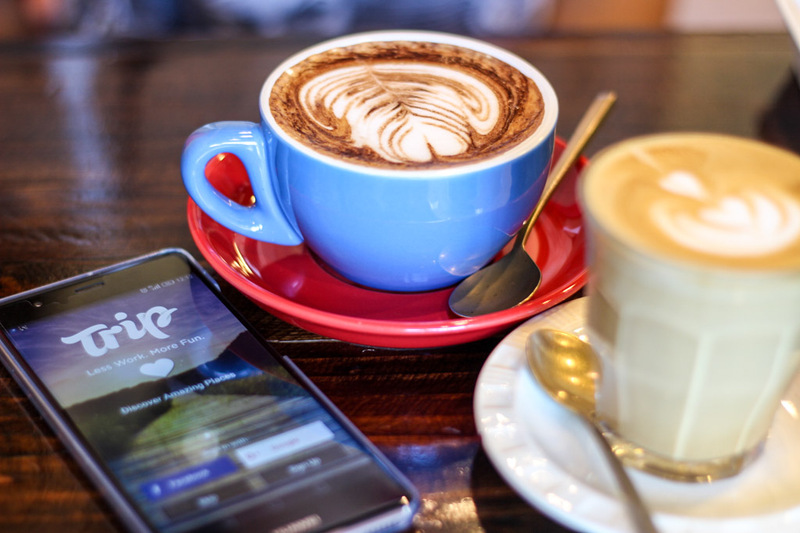 To discover the best places to visit in Chiang Mai we used Trip.com, a cool app that gives you recommendations based on your profile and the tribes that you like. It was our first time using the app and it gave us some really good travel tips. If you don’t believe me, download Trip here and after reading this post you can check all the reviews in the app and be sure that all our Chiang Mai itinerary is spot on. Our list of what to in Chiang Mai and places to visit can fit in a 2 or 3 days trip. If you wake up early you can do a lot, enjoy the attractions in town and then explore the surroundings, it’s all up to you! The Doi Suthep Temple is one of the most famous tourist attractions in Chiang Mai, everybody goes there and you must visit it too. But let’s explore one of the best places in Chiang Mai at the best time: before the sunrise! No I’m not joking, we left our apartment at 5:30 AM and we drove our scooter all the way up hill. If you don’t have a scooter, or don’t feel confident to drive, hire a taxi or a Uber. Climb the dragon stairs, on the top of the staircase turn to your right side and walk until you find the panoramic deck, sit and wait for the spectacle. After the sunrise go visit the temple, Doi Suthep is stunning, with beautiful statues, and a unique decoration. Early in the morning there are few people there, so you can enjoy the place and watch the monks doing their morning duties. Because is too early, the ticket desk will be close, it’s not a problem, go inside visit and when you leave the temple stop by the entrance and pay for your ticket. 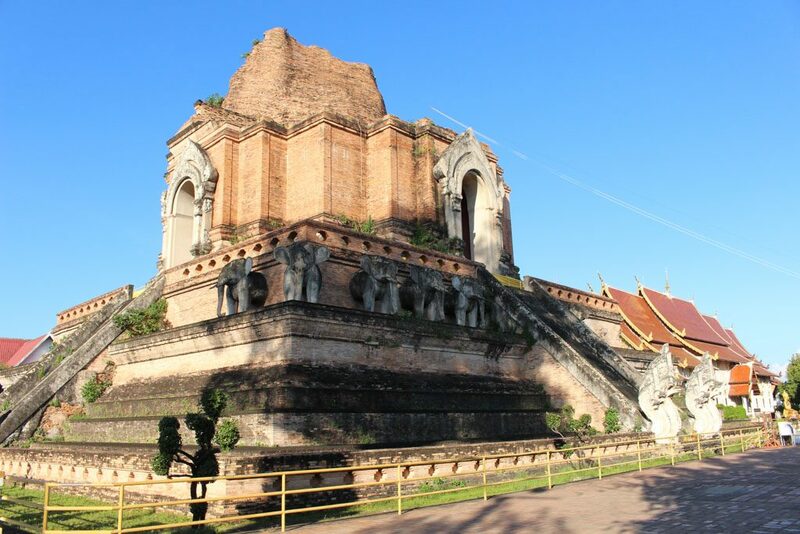 Wat Phra Singh: in the heart of old town this is one of the most visited attractions in Chiang Mai. Wat Pan Tao: this temple is all made of wood, an outstanding carving work. Wat Buppharam: this temple is located outside Chiang Mai old town, a few meters from the Tha Phae Gate. Due to the Burmese influence this temples has a unique design. In some of these temples you can talk with Monks, learn about the Buddhist doctrine and even ask for spiritual advice. Don’t forget to dress respectfully. This little temple is mind blowing, it’s so unique and so beautiful that hurts to look at it. Hidden in a small street close to the South Gate of Chiang Mai old town, it’s a truly gem. Most of the people call it the Silver Temple, and it’s easy to understand why. 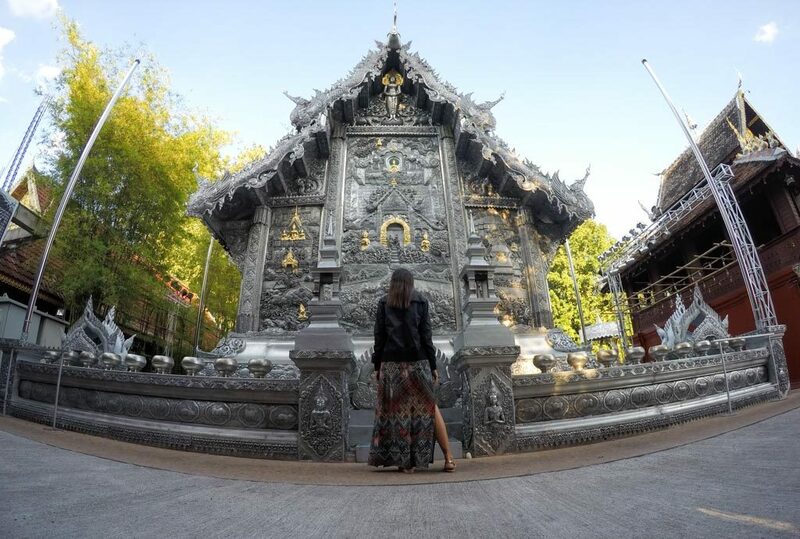 The Wat Sri Suphan is all covered in a shiny coat made of silver or aluminum, everything handmade and designed by local artisans. Insiders Tip: if you visit the temple on a Saturday, go there before sunset. The sun hitting the temple is stunning and most of the weekends there are performances in the garden and food stalls. 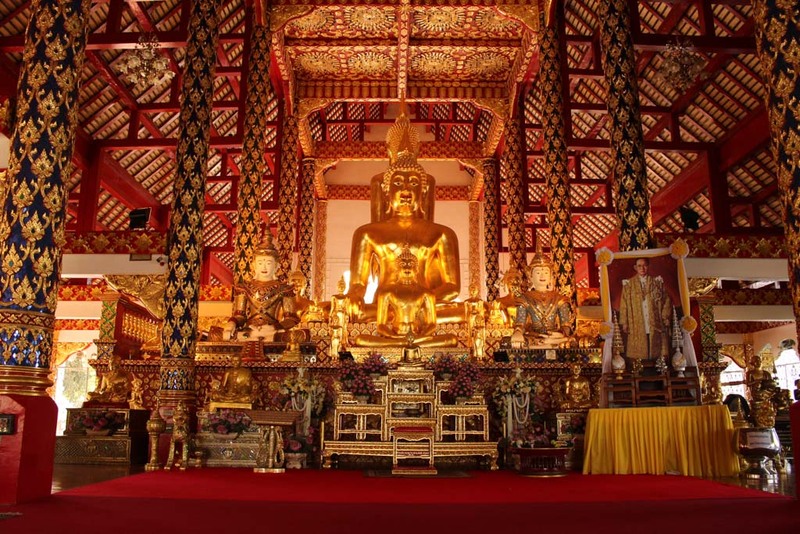 Searching for places to visit in Chiang Mai, the Trip App suggested us to go to the temple Wat Suan Dok. We followed the directions and when we entered in the temple we were swept away. 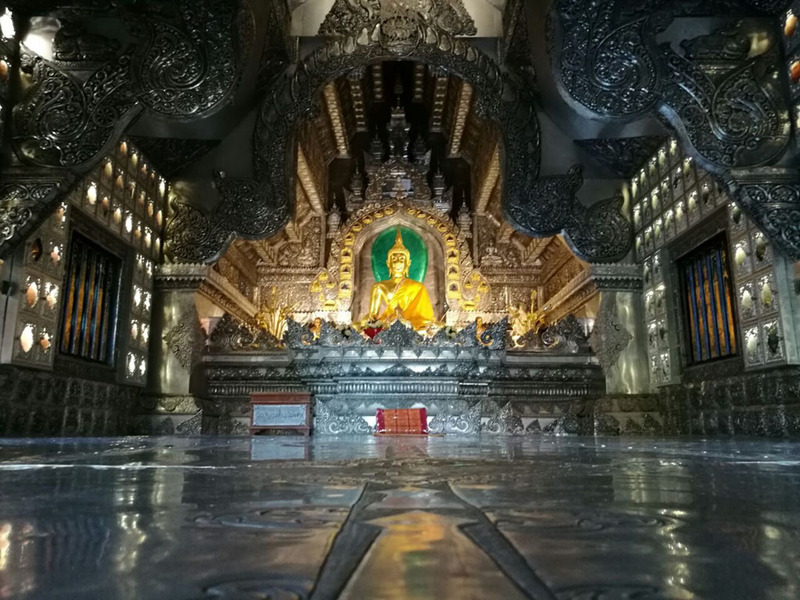 The huge golden stupa is impressive, but not as extraordinary as the 500 years old bronze Buddha that stands inside the temple, one of the biggest in Thailand. The temple is located outside the old town, it’s close to the trendy Nimman area. It’s a beautiful temple, but not many tourists go there, what makes it even more special. It’s definitely one of the unique places to visit in Chiang Mai. 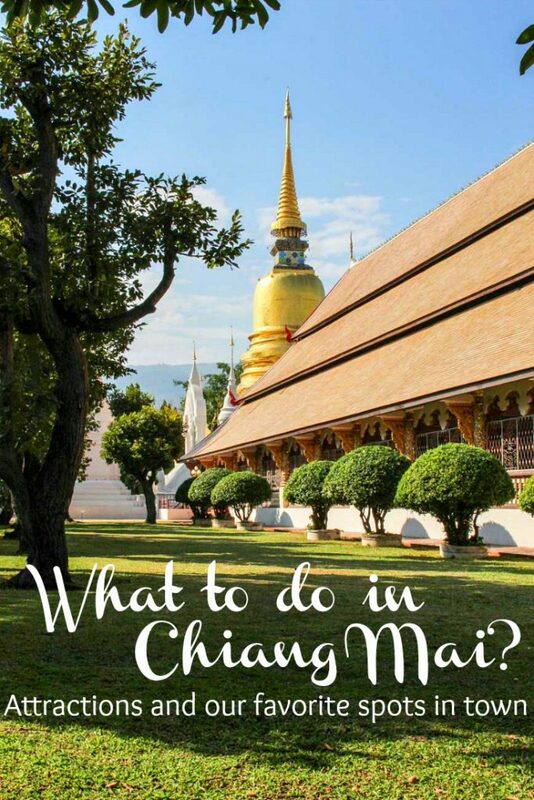 What to do in Chiang Mai to Relax? I know, you want to visit all the attraction in Chiang Mai and I’m sure your days will be filled with interesting activities, but don’t forget to relax! What to do in Chiang Mai to unwind your body and lift your soul? We will give you three suggestions: massage, cats and nature. Chiang Mai has massage parlours and spas is almost every corner. Yes, the masseuse are working even on the sidewalks, so if you are tired of walking you can just sit and get a relaxing foot massage in the middle of the street. But let’s take this relaxing moment to another level. Where to go in Chiang Mai for a good massage? My answer is: Lila Thai Massage! Their mission goes beyond relaxation, all the women that work in Lila are former inmates from Chiang Mai Women’s Prison. They were carefully selected and trained to work in the shop. The idea is to help them to start a new life, get back to society and build a better future for their families. Going to Lila Thai Massage you do your share to help Chiang Mai to be a better place. 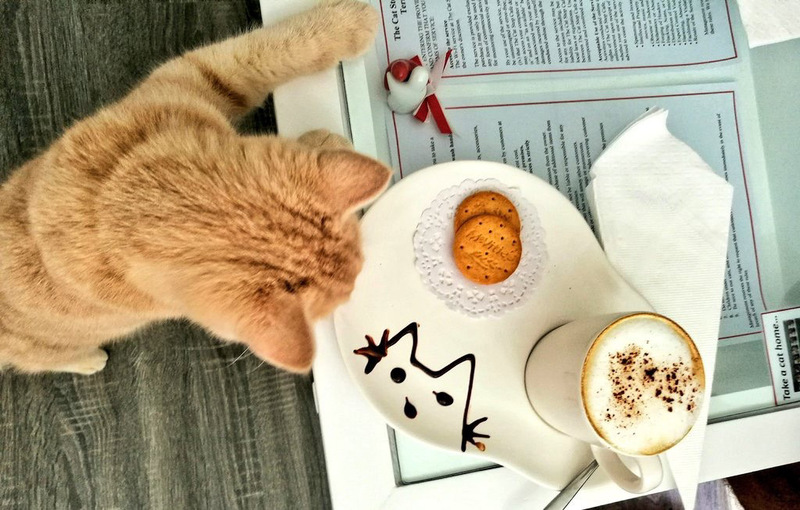 For a puurrrfect time, grab a mug of cappuccino and stay hours playing with cats. There are many cat cafes in Chiang Mai, but our favorite is The Cat Stop, and they have baby kittens running around what is adorable. I didn’t try the food there, so I can’t recommend, but the coffee is good and as long as you buy a drink you can stay for hours playing with the cat. Follow the rules and be happy with your new furry friends. If you don’t like cats, sorry, but what is wrong with you?? 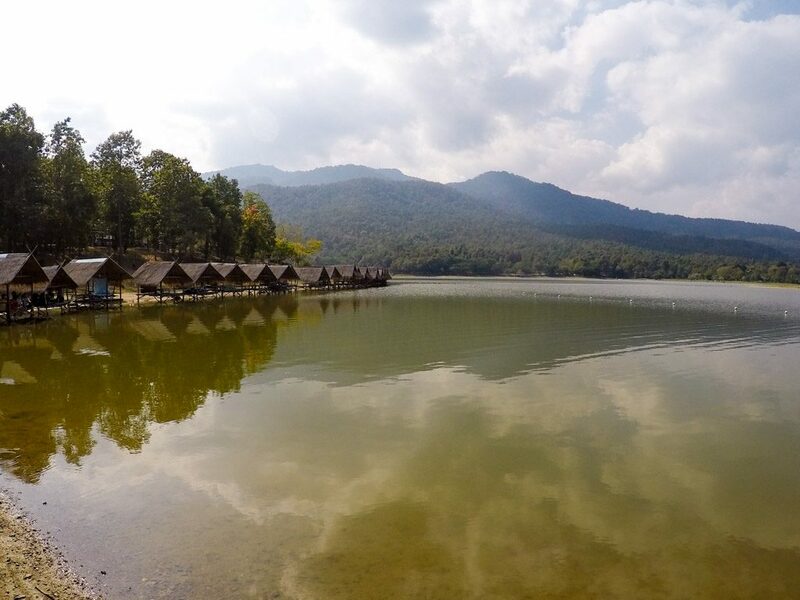 Located on the foot of Doi Suthep mountain, this fresh water reservoir is the perfect spot to relax and enjoy nature. The lake is famous among local, so don’t be surprised if you are the only foreigner swimming or doing a picnic there. The lake has many huts by the water where you can have lunch and relax.To rent one of them talk with the guys from the restaurant. Or bring your towel and stretch yourself under the trees. What to do in Chiang Mai at night time? Markets & Drinks! We have talked about attractions and what to do in Chiang Mai during daytime, now it’s time to talk about fun! By law all the bars and clubs must close at midnight, because the early closing hours, you can start your night out in Chiang Mai right after sunset. 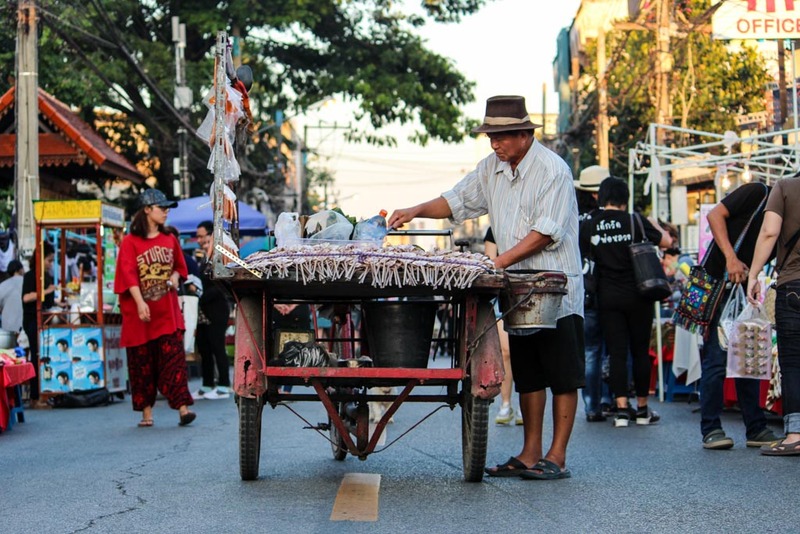 Looking for what to do in Chiang Mai in evening? We have you sorted! In Chiang Mai every day is a market day, but the biggest and the most famous street markets in town are the Saturday & Sunday Market. The Saturday Market happens on the south gate and stretches for kilometers. Food, handcrafts, clothes, souvenirs, you can find everything you want. 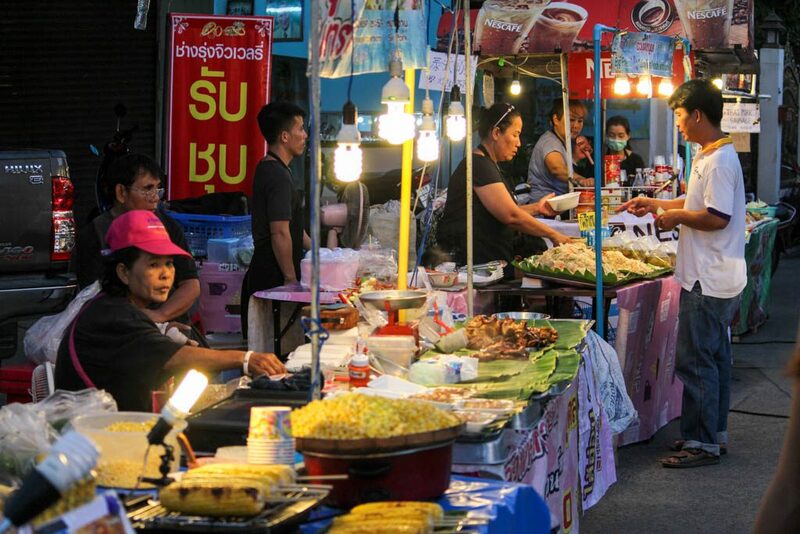 It’s the perfect place to try the local street food and buy those little present you need to take home. The Sunday Market is very similar to the one that happens on Saturday, but it is a bit bigger and it takes the central street of the old town, starting at the Wat Phra Singh and finishing at the Tha Phae Gate. If you are looking for local delicious food, check the stalls inside the temples, there you can find some local delicacies. Both markets start at 5PM, but they get really busy after sunset. They are a great way to start the evening, go for some food, a foot massage and later drinks. Be aware that you are not allowed to drink alcohol while walking through the market, as it is an alcohol-free zone. But if you order a beer at the food stall drink while eating, then there is no problem. We were searching for a nice bar to watch the sunset and have cocktails, and Trip App suggested the rooftop bar from Sala Lanna Hotel, and although it’s not a super high building, it definitely has a great view. This bar is lovely and it’s located on the banks of Ping River. The place is beautifully decorated and they have some happy hour promotions from 6 to 9PM. What else can you need? Nice view, open air bar and drinks! I’m a happy girl! What to do in Chiang Mai to keep the party mood on? Go to the Cabaret Show, it’s great! Not only the girls are beautiful, the performance is nice, the vibe is really friendly and you gonna have a good time. 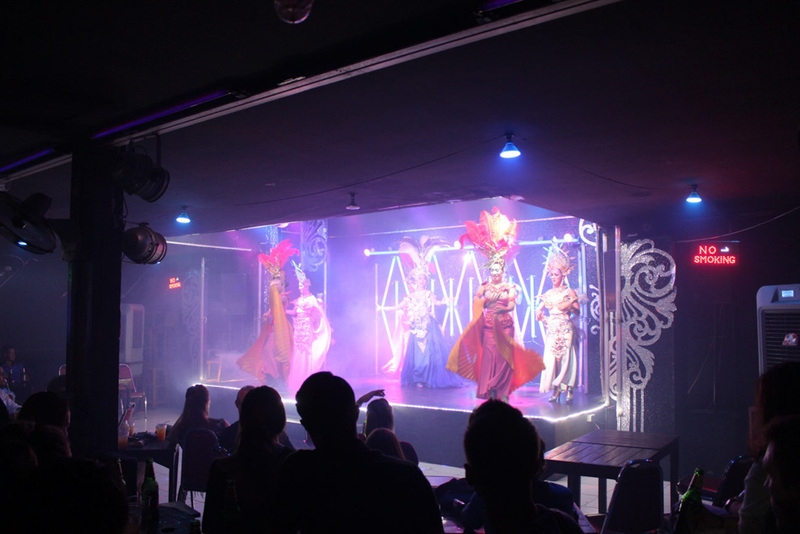 The Chiang Mai Cabaret is located at the Anusarn Night Market, the show is daily at 9:30PM. Where to eat in Chiang Mai? From Breakfast to dinner! In Thailand, Chiang Mai is our favorite place to eat. Food there is fresh, delicious and you can find from local recipes to western restaurants. Apart from the street food, that you must try them all, here are our recommendations for restaurants, cafes and places we like to go for a special meal. Everything on their menu is delicious, we have tried almost all the sandwiches and breakfast meals and hands down. They know how to mix ingredients and create unique flavours. 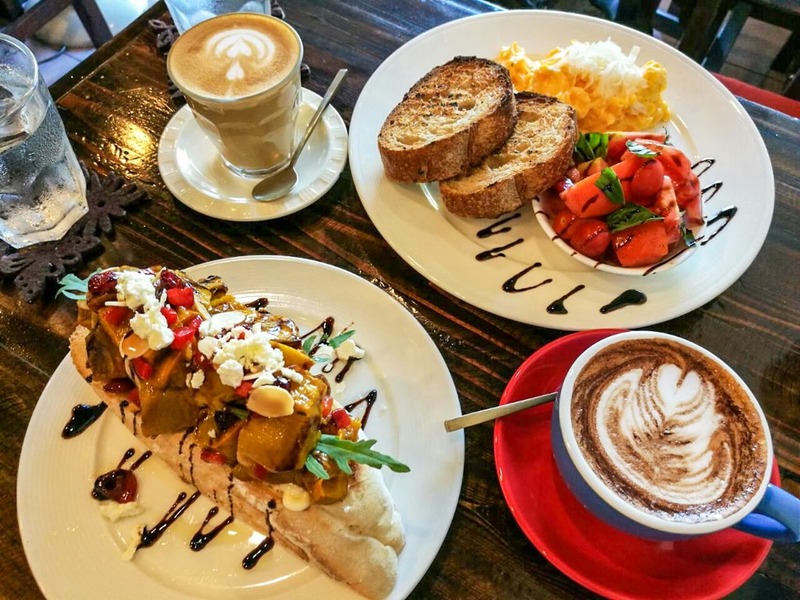 The Larder is a small cafe, and opens daily from 8AM to 3PM, so you might need to queue for a few minutes, but it’s totally worth it. Plus the staff will greet you with smiles, a perfect English and a glass of water to cool you down. Asian flavours, organic ingredients and tons of love. Pun Pun Vegetarian Restaurant is located inside the Wat Suan Dok and it’s such a simple restaurant that you might pass by without noticing. But the food they serve is nothing ordinary, the mix of flavours is incredible and all the food comes for local organic farmers. Our favorites are: the pomelo salad with mushrooms and peanut sauce and the curries. It’s a vegetarian restaurants, but even Rob, a meat eater, loves to have lunch there. You probably noticed that we like healthy food. None of us are vegetarian, just happened that we like good fresh food and in Chiang Mai you can find amazing options to eat healthy. Salad Concept is one of the places we go frequently, they have delicious salads prepared in a blink of eye. 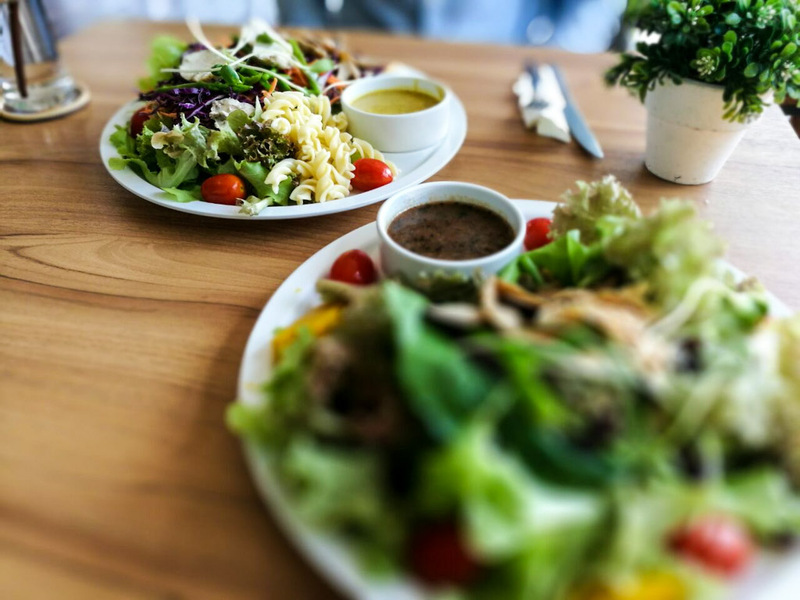 Doesn’t matter in which part of your Chiang Mai itinerary you are, you can easy grab a fresh salad for lunch or dinner as their have two restaurants, one near the Tha Phae Gate and other at Nimman Road. This suggestion is for those special nights when you want to have a well cooked western dinner with a twist of Thai flavours. At David’s Kitchen the menu is mouthwatering and the British – Thai couple promise to serve you as family. Food, massage, temples… What else can you do in Chiang Mai? Tons of things, from climbing a sticky waterfall to cliff jumping. So we decided to list 3 more activities, things to do in Chiang Mai that are different and can make your trip memorable. We like tattoo, and I don’t know why, but every time we arrive in Chiang Mai we need to do a new tattoo. Last time we had a powerful experience doing a Sak Yant Tattoo, the blessed tattoo made by a monk with a bamboo stick. It was such an intense experience that we wrote an article about our Sak Yant Blessed Tattoo. However, this time was we just want a nice well designed tattoo, and we did it. If you feel like putting some ink on your skin to celebrate your travel and your visit to Chiang Mai, the place you should go is the Modzilla Studio. Mod is experienced and follow all the safe protocols. 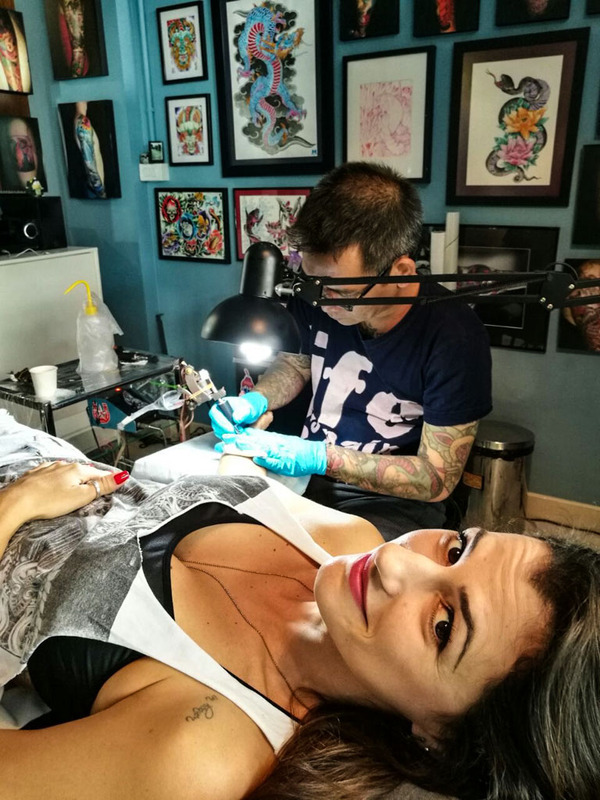 If you are looking for something different to do in Chiang Mai and you have the guts to face some needles, go for a new tattoo. Chiang Mai nature is unique and there are plenty of activities and places to visit around town. You can book a tour or even go by yourself to the Sticky Waterfall [Buatong Waterfall]. Due to the calcium formations on the rocks you can literally climb the waterfall barefoott. 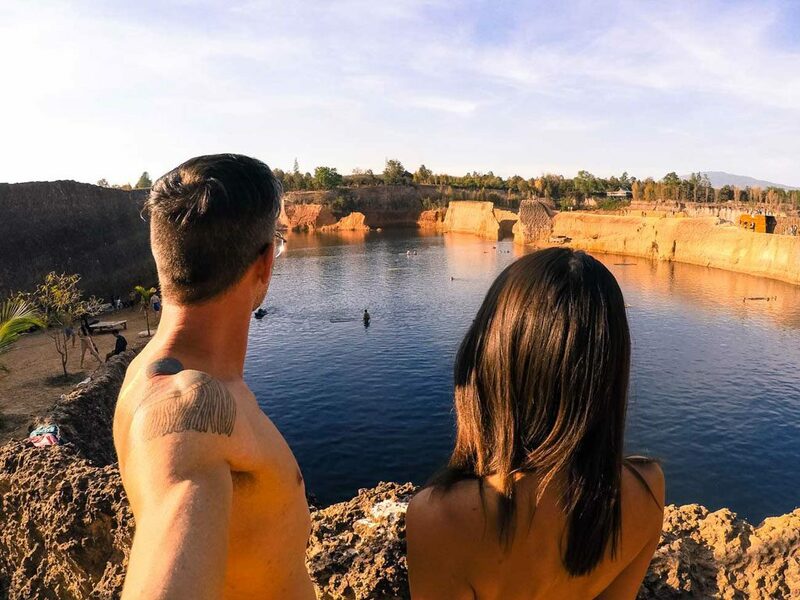 Maybe some cliff jumping the old Hang Dong Quarry? The place is also called the Grand Canyon of Chiang Mai, but it’s not a canyon neither grand, but big enough to have a great time jumping and swimming. Perfect for those super hot days in Thailand. By now you are probably asking why we didn’t talk about the Elephant Camps and The Tiger Kingdom, as they are some of the most famous attractions in Chiang Mai. The real deal is that we don’t agree and we don’t recommend those type of activities. And you as a responsible traveller should avoid them too. I know there some nice and correct Elephant Sanctuaries in Chiang Mai, but as we never visited one of them we can’t recommend. My advice is: if an activity involves a wild animal that is not free in the nature, or not in a natural park being protected then I don’t want to do it. I won’t lie, I have done tours and activities with wild animals before, but now I know the consequences. I believe is my duty as a blogger to share this with you. Our list of what to do in Chiang Mai finished, I hope you like our suggestions. And I’m really excited for you to try some of our favorite spots in town. If you are looking for the best place to stay in Chiang Mai, check Agoda website, they have awesome deals and great hotels in Chiang Mai. If you have only a few days in town I suggest you to stay at the old town, or close to the Tha Phae Gate, Nimman area is also a nice spot and it’s growing as the trendiest neighborhood in the city. To get around Chiang Mai is easy, you can rent a scooter explore everything on your own pace. There are shops renting scooters almost everywhere in the old town. Also you can use the songthaew [the red buses] or the traditional tuktuk. Even with the language barrier most of the drivers are nice and they know all Chiang Mai attractions. 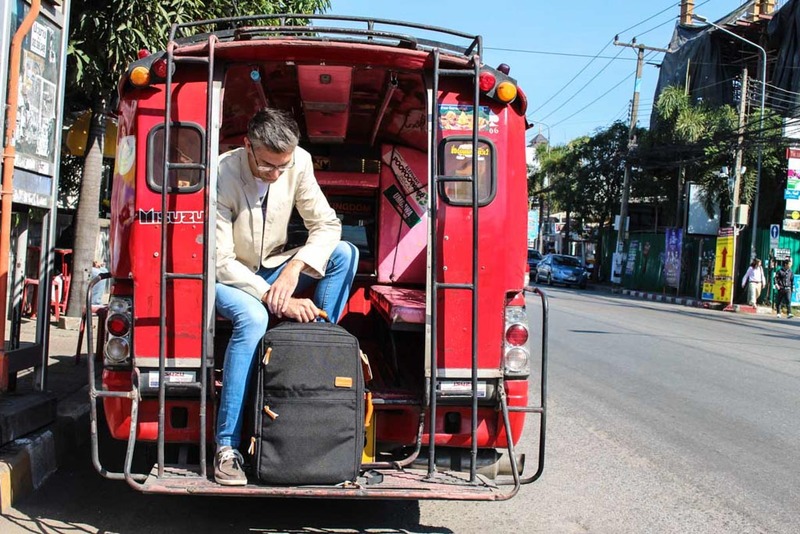 If you need some info about living in Chiang Mai as a digital nomad, check the interview we did with some travellers to find out why Chiang Mai is the favorite places for nomads. And if Chiang Mai is only part of your adventure across Southeast Asia then you are in the right place, we have a bunch of inspiring story and guides to Thailand. Enjoy your time in Thailand, follow our tips to what to do in Chiang Mai and have fun! I stayed in Chiang Mai a few months and am also guilty of not really looking around much. I did however get tattooed by Mod and ate at Pun Pun several times! Are you guys there now? Seriously?! You got a tattoo by Mod, what a coincidence! We just left Chiang Mai, and already missing the food and the vibe of that lovely city! The Sala Lanna rooftop bar looks really nice especially after a long day sightseeing. Although I think we would give the Cat Stop cat cafe a miss . The Sala Lanna rooftop bar is must for sure! The view and the drinks are great! 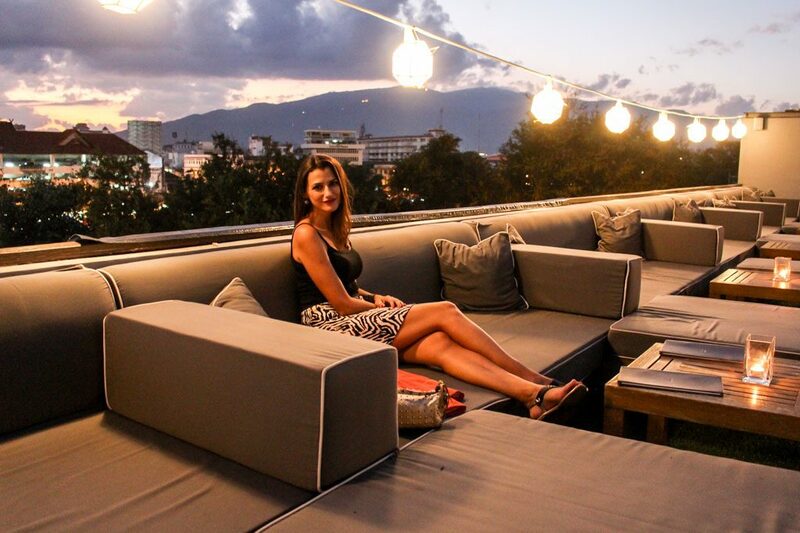 We loved Chiang Mai and did everything on your list except visit the rooftop bar. We only had 5 days there but loved every second and had a massage every day because it was so cheap. It’s no wonder you’ve visited Chiang Mai 4 times in 3 years! Yes, the massages are cheap and soooooo good! 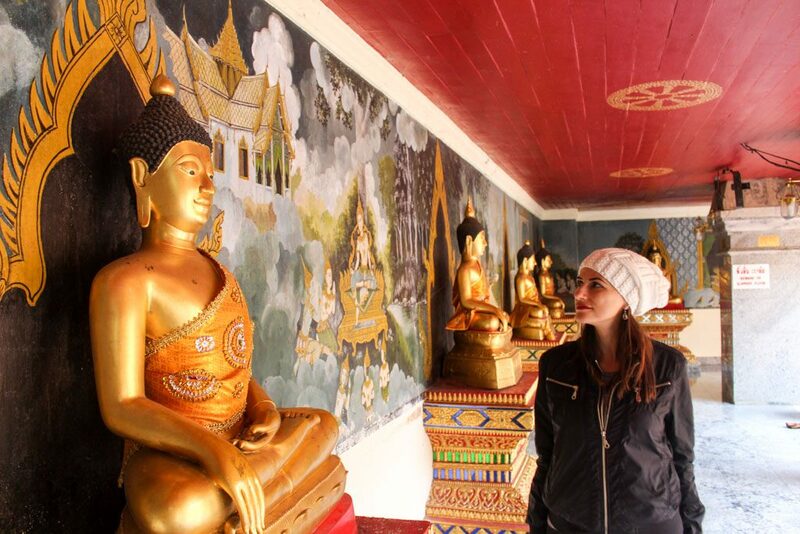 I’m glad to know that you visit most of the places, no doubt they are the top things to do in Chiang Mai. Have been to Thailand 8 times but Chiang Mai has eluded me till now. But I know whenever I go, you both are going to be my guide. Miss you both. Thanks Nisha!! You are always so sweet! It will be my pleasure to guide you around Chiang Mai, the city has amazing places to visit. The temples and markets in Chiangmai are classic. I’ve been there a few times but haven’t been to the cabaret show or the eateries you mentioned. There are some fantastic places to stay in Chiangmai. Thanks for stopping by! Chiang Mai is full of hidden gems, if you have the opportunity t go back try some of the restaurants we mentioned, they are delicious! This is very handy! I will be visiting Chang mai soon, thanks for sharing this. I will definitely visit the Cat Shop! The cats look so adorable. Enjoy Chiang Mai, it~s a lovely city!! I ran out of money before I got to explore most of Thailand. Seems like there’s a lot to do here, I would definitely do some of these things when I return to the country! Thanks for sharing! You need to go back to Thailand Tom! So many stunning places to visit, and Chiang Mai is a must visited city! My favorite part of Chiang Mai was definitely visiting the many temples. I only spent a few days though so if I ever go back, I’ll try to do more. The roof top bar looks fun! You should go back Vicky! Chiang Mai has great hidden gems! I have been been to Chiang Mai twice and I love the Salad Concept 🙂 been there quite a few times. I spent 10 days in Chiang Mai and the islands. There is too much to do, see, and eat. I can feel it in your pictures. Its wonderful. Yes, there are so many things to do in see in Thailand that you can spend months exploring that beautiful and interesting country. We are happy you liked the photos. Amazing review about our city. Thank you!